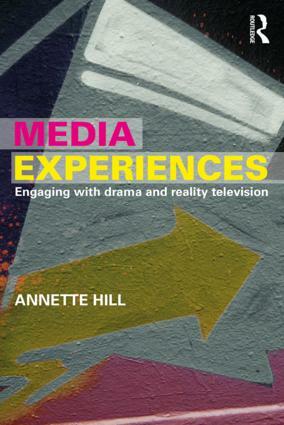 Media Experiences: Engaging with Drama and Reality Television travels across people and popular culture, exploring the pathways to engagement and the various ways in which we shape and are shaped by the media landscapes in which we move. This exploration includes the voices and bodies, sights and sounds of audiences as they experience entertainment through television drama, reality TV, at live events, and within digital television itself as actors, participants and producers. It is about the people who create the drama, live events and reality entertainment that we experience. This book traverses the relationships between producers and audiences in shared places of a media imagination. Annette Hill’s research draws on interviews and observations with over 500 producers and audience members to explore cultures of viewing across different genres, such as Nordic noir crime drama The Bridge, cult conspiracy thriller Utopia, and reality television audiences and participants in global formats MasterChef and Got to Dance. The research highlights how trends such as multi-screening, catch up viewing, amateur media and piracy work alongside counter-trends in retro television viewing where people relish the social ritual of watching live television, or create a social media blackout for immersive viewing. Media Experiences bridges the divide between industry and academia, highlighting how producers and audiences co-create, shape and limit experiences within emerging mediascapes. Annette Hill is Professor in Media and Communication at Lund University, Sweden, and Visiting Professor at Kings College London, UK. She is co-chair of IAMCR's Audience Section.